Finally, we managed to have a dinner in our new home like in the good old days in Thonglor. All four of us sat on the terrace and enjoyed a family meal together. 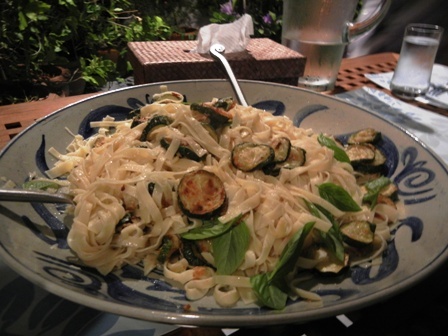 The pasta (zucchini) below was just delicious. I went through my wine fridge but could only produce a bottle of ‘2008 Cabernet Sauvignon’ by Beijing Dragon Seal Winery, China. It was given to me by the hotel manager during my last trip to Beijing. 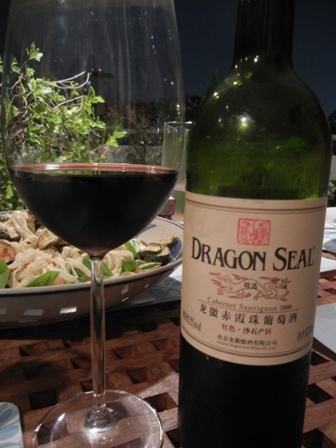 A bottle of Dragon Seal red wine was one of our first wines when we moved to China in 1990. The winery has quite some history which goes back to 1910 and some French friars in Beijing who started to grow grapes and make wine. 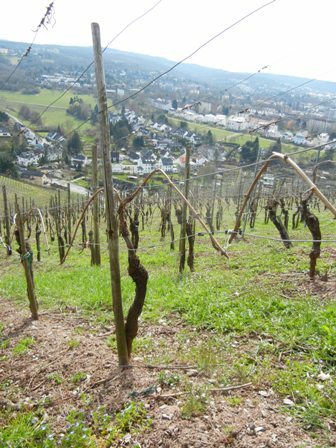 Ever since French viticulturists and oenologists have been associated with the brand. The modern Dragon Seal Winery was founded in 1987. Various white and red wines are produced today. The grapes are grown in Huailai County (怀来县) in Hebei Province about 150 kilometers northwest of Beijing which has a semi-arid climate. The precipitation in this part of China is very low (below 400 mm per year). Mean temperatures range from -7.4 Celsius in January to about 24.4 Celsius in July. Humidity in August-September is between 60 and 70% only. 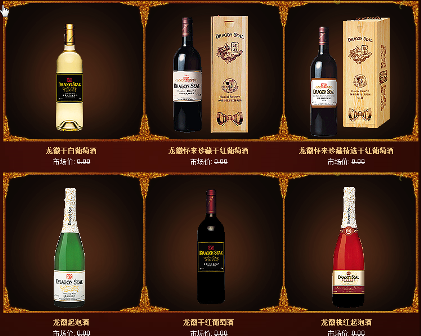 The flagship wines of Dragon Seal Winery are it’s Huailai Reserve, a blend of Cabernet Sauvignon (50%) and Syrah (50%) which is matured for a year in French and American oak and it’s Cru de Huailai, a 100% Syrah made from grapes grown in Donghuayuan (东花园镇). Does this not sound very exotic in your ears? Well, the 2008 Cabernet Sauvignon is a solid but overall ordinary wine (‘Landweinkatagoerie’). The enclosure consisted of a plastic “cork” (uuh). I was immediately suspicious. 2008 vintage (! ), but was the bottle sealed properly? Yes it was. The wine has only 12% alcohol. The colour was a beautiful dark red. But the taste was OK. It is a rather light wine with pleasant red fruit aromas. We did not regret opening the bottle, and it also matched the pasta somehow. I must try the two flagship wines mentioned above. They won medals at international wine shows. That’s my resolution from this wonderful family meal in Ekamai. 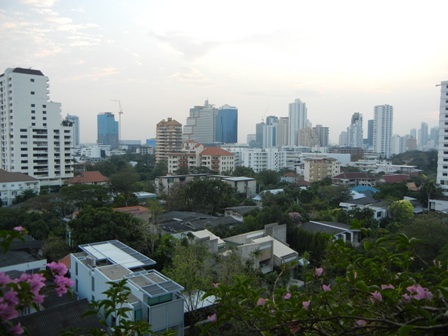 I returned from Germany to our new flat in Ekamai, Bangkok. Our family had moved in my absence; wife and children did all the hard work, I had just to get back. I was still shocked somehow. It takes a while to get used to new quarters. My rule of thumb is the following: if you can freely walk through your house in complete darkness and without knocking things over and bloody toes, feet and knees, you’ve made it. I know from experience, that it takes about one year to get to that stage. Well, the first night was a nightmare. The sounds were complete foreign to me and very strange indeed. The wind howled around the bedroom corner; dogs kept barking through the night, it seemed. I did not expect that moving from the third to the tenth floor would bring such inconvenience. I felt completely unsettled, slept badly for days. But as an optimist by nature, I know that I will get over it. Just give yourself some time, I said to myself to calm me down. PS: Needless to say that I could not find the inner balance to write anything for this blog. My blogging is in disarray. I have no place yet where to put my computer. I need a place to do my blogging stuff with my small wine library on hand, some old bottles of wine, brochures and information materials. I will work on it. Spring is in the air in Germany. 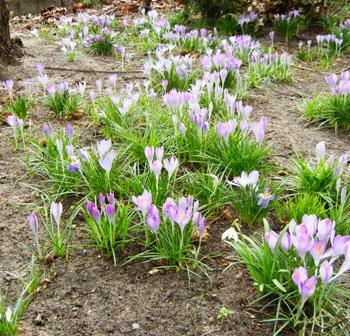 Although still cold, the sun has warmed the earth and the rain has helped to moisten the otherwise dry Berlin soil so that some early spring flowers can raise “their colours”. The bird know that winter is basically gone, and that spring is in the air. Their cheerful songs are filling the air in the mornings and evenings. It’s just beautiful. I was not very hungry but needed some food. So why not to have a snack in a Greek restaurant, let’s call it Zeus? I needed something light and cheesy and that’s what I got. 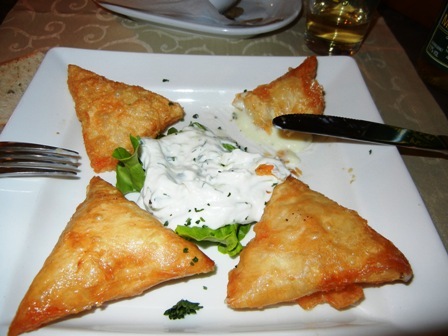 The ‘tiropites’ or ‘tyropitakia’ (turnovers in English) were filled with feta cheese and served with tzaziki. Very delicious indeed. As regards the choice of wine, I also decided on something earthy, simple, what the rural folks might drink. 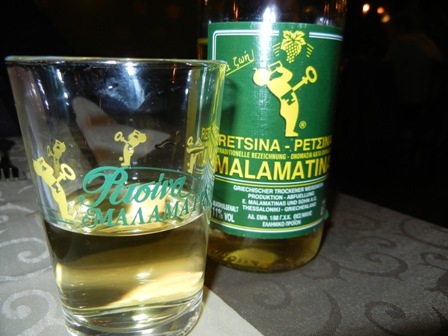 Therefore I ordered the house retsina (Ρετσίνα in Greek), the traditional white (or rose), resinated wine, which has been made for more than 2000 years on the Greek islands. It turned out that this was a very good choice. I had a very enjoyable evening, a tasty meal and a good wine. God was Greek, as well know. 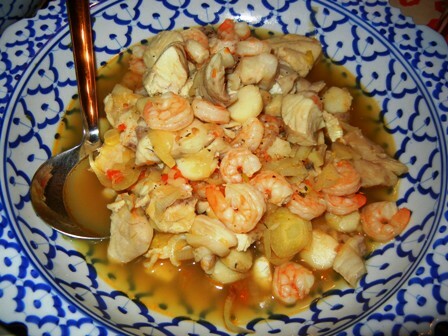 It was about a week ago that we had a wonderful simple but tasty Sunday meal at our home in Thonglor, Bangkok. 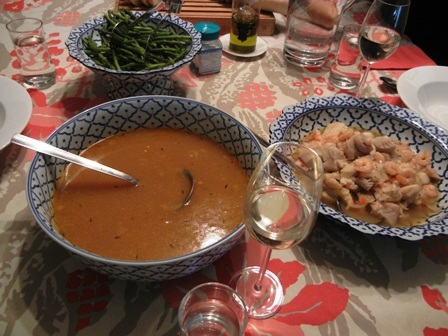 It consisted of a French fish soup or bouillabaisse. 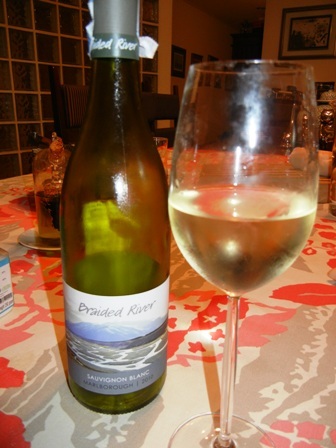 The wine we selected for the meal was a ‘2010 Braided River Sauvignon Blanc’ from new Zealand. Braided River Wines is a family run boutique vineyard near Christchurch which produces hand crafted wines. The winery takes it’s name from the Waimakariri river and it’s braided arms. The wine comes with a price in Bangkok which is about three times the price in New Zealand. But it’s worth it, I should say. It is what one expects from a typical New Zealand SB. 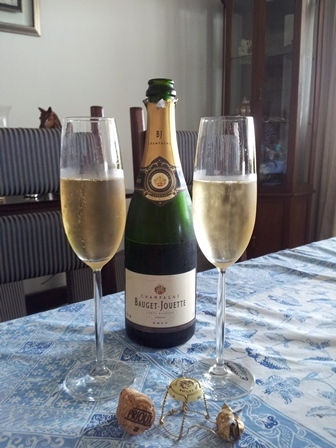 Straw colour with aromas of tropical fruit and grass, beautiful texture, and a long finish. We did not regret to have paid the exorbitant price. In a country with less taxes on alcohol this wine is very affordable. You should try it. 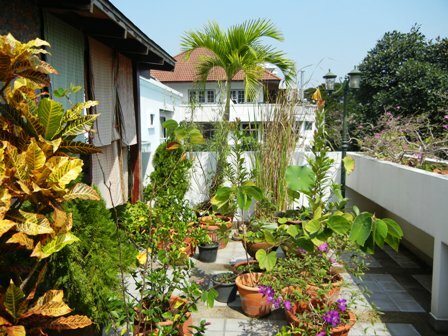 Today was the last day on my terrace garden in Thonglor. We are moving from Wednesday onwards into new premises in Ekkamai, just a block further away from our beloved Baan Phansiri which was our home for the first two and a half years here in Bangkok. “From all that he loves, man must part”, is an old saying, and parting it is again. 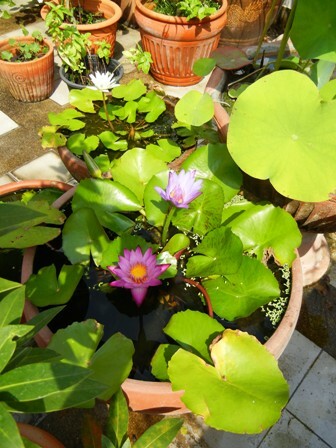 I have had my own gardens since university days, often together with friends. 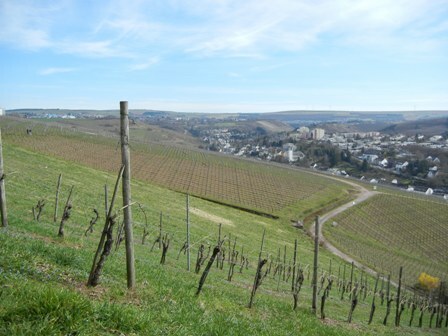 Hans-Heinrich Schuessler, my maternal grandfather, introduced me not only to appreciate wine but he also laid the seeds for my gardening passion. When I was just a little boy he took me with him to his many gardens. 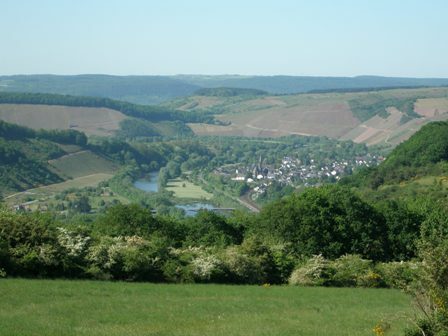 As station master of the German Railways, my grandfather had various gardens along the railway line in Martinstein, Nahe – a wonderful wine region by the way. I never had to do any work. That was somehow the trick, I suppose. Friends of mine who were made to work as children usually hate gardening or agricultural tasks. In striking contrasts I just love them. 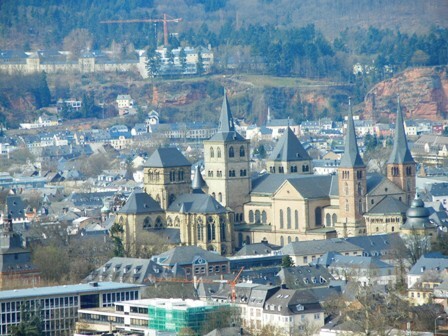 Together with friends at Bonn University I cultivated various gardens in the vicinity of the university town. I planned fruit trees, scrubs and vegetable patches, and left all behind when moving abroad. Every garden partner had his skills, his passion and his magic. And we celebrated many parties deep into the night in our gardens. Later in Rome I set up a terrace garden overlooking Garbatella, a resettled neighborhood south of the city center. My lemon trees produces beautiful fruit. In Beijing I had a glass corridor on the 11th floor which I greened with various indoor plants. In New Delhi I grew Indian vegetables. Our household staff watched in disbelief when ‘sahib’ got his hands dirty while digging in the back garden. But when they saw the veggies growing strongly, they all asked me for seeds. The biggest tropical garden I ever had was in Jakarta, in Lebak Bulus, in South Jakarta to be precise. Five rambutan and two mango trees were a constant source of sweet and wonderful tropical fruit. I grew also papaya and star fruit. 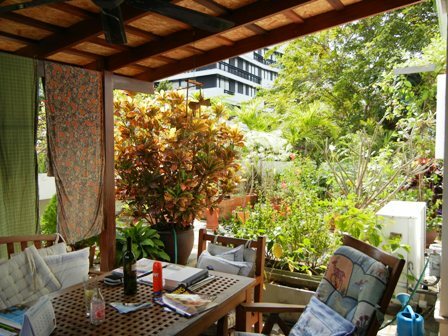 Here in Bangkok the terrace was my place to relax and dream. Quasi an illusion, a place to worship nature, but basically to make me forget the noise and pollution of the city around me with its huge construction sites, the skyscrapers, and the constant stream of cars, and endless noise. Today, I prepared my many pots for the move. I had to cut a few bigger scrubs and transplant some others. Also my many orchids needed some tender care. Since I have to leave for Germany today, I will not be around for the move next week. 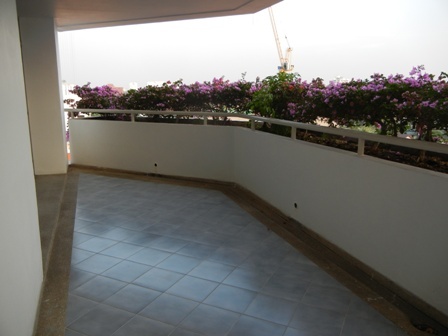 I will have a terrace in the new location as well but a covered one (therefore not all my plants will grow), and not one with an open sky. So I had to lay there for a last time and look up into the clouds and the endless sky. Needless to say that I am very sad to leave this place where I felt so much at home. But as the saying goes: “From all that he loves, man must part”, and so I try to look ahead with beautiful memories which no one can take away from me. 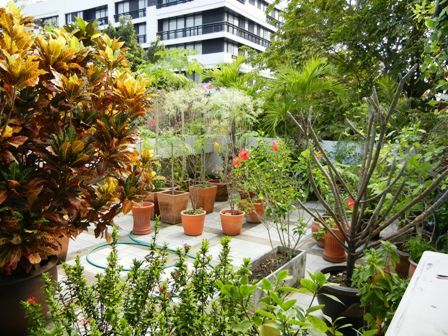 Good bye my terrace garden in Thonglor. Thank you for the pleasure and the good times. 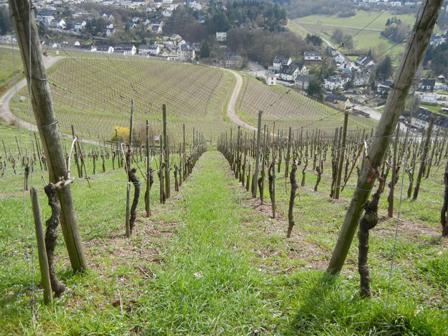 You are currently browsing the The Man from Mosel River blog archives for March, 2011.